Door Bells come in a wide variety of styles and finishes. Emtek offers a huge selection and if your are using Emtek door hardware throughout your home, you'll easily be able to find a matching doorbell. Even if you are not using Emtek hardware, there are so many style options we should have a doorbell that will coordinate with your door hardware of another brand. 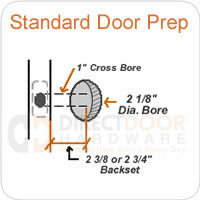 Most homes are pre-wired for a door bell, but generally just include a very basic plastic doorbell. These doorbells are a direct replacement. Keep in mind, some of these decorative doorbells are up to 3" wide, so you'll need to make sure that it will fit where your wiring is. Home must be prewired for doorbell.